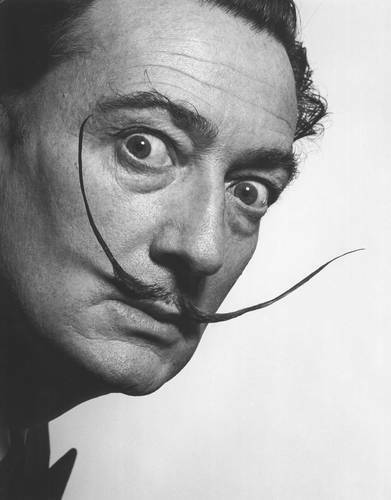 The Paranoiac-critical method was the invention of Salvador Dali and is an extension of the method of Simulation into the field of visual play, based on the idea of the 'double-image'. "For instance, one can see, or persuade others to see, all sorts of shapes in a cloud: a horse, a human body, a dragon, a face, a palace, and so on. Any prospect or object of the Physical world can be treated in this manner, from which the proposed conclusion is that it is impossible to concede any value whatsoever to immediate reality, since it may represent or mean anything at all" (Marcel Jean). The point is to persuade oneself or others of the authenticity of these transformations in such a way that the 'real' world from which they arise loses its validity. The mad logic of Dali's method leads to a world seen in continuous flux, as in his paintings of the 1930s, in which objects dissolve from one state into another, solid things become transparent, and things of no substance assume form. The Paranoiac-critical method is thus the reverse of the children's 'picture-puzzles' in which people are hidden in drawings of trees etc, and resembles more the 'double-images' employed by psychologists. The two faces that become a vase, and other similar illusions such as faces seen in rocks, landscapes in marble and the anthropomorphic forms of plants such as the mandrake root.